We live in extraordinary times. While Los Angeles presents some of the toughest mobility challenges in America, the world is experiencing levels of transportation innovation unprecedented in recent memory. And these changes are in turn redefining what an agency like Metro should be. To take advantage of the promise offered by these opportunities, Metro has set a goal to be the most innovative transportation agency in the country, ensuring that we are using every tool at our disposal to help improve mobility in LA County. With that in mind, the Office of Extraordinary Innovation was established to explore new ways to move LA by finding and testing leading-edge ideas that have potential to improve mobility for the people in the region. From public private capital partnerships to cutting edge new technologies, OEI is tasked with identifying, evaluating, developing, and implementing these new approaches. These efforts may be undertaken by Metro on its own or jointly in collaboration with private sector firms through public-private partnership agreements . To carry out this work, OEI has three tools. Unsolicited Proposals allow private-sector companies working on transportation innovations to present new ideas directly to Metro for review and evaluation, jump-starting the traditional public procurement process. The most exciting proposals could lead to a demonstration, a pilot project, or in the most successful cases, full deployment across Metro’s system. 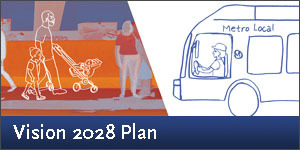 Metro Vision 2028 is our agency’s big picture plan to improve mobility in Los Angeles County and explains what the public can expect from Metro over the next ten years. This is a bold and ambitious plan that intends to marshal the creativity, resources, and political will to shape our mobility future and unleash Los Angeles County’s unparalleled economic and social promise. Vision 2028 is the result of more than 17-months of research, discussion, and outreach by the Office of Extraordinary Innovation. The draft Vision 2028 Plan was formally released to the public on April 27, 2018, followed by a four-week public comment period. The Metro Board of Directors will consider adopting the Plan at their meeting on June 28. Internal Consulting allows OEI to flexibly and strategically engage in Metro initiatives where increased capacity and support or innovative and collaborative approaches are needed to develop and implement ideas of importance to Metro and the region. Our theory is that by putting a focus on smart long-term goals and opening our doors to the innovation occurring in the private sector, Metro has the potential to create something in LA that is truly extraordinary.